Although the East London Group achieved commercial success and huge media coverage in the late 1920s and early 1930s, its story has never been told. Inspired by the charismatic teacher John Cooper, its artists achieved shows at the Whitechapel Art Gallery, Tate Gallery, in the provinces and annual exhibitions in the West End. By 1936, two Group painters were showing at the Venice Biennale. Arnold Bennett, Joseph Duveen, Aldous Huxley, Ramsay MacDonald, Edward Marsh, Michael Sadler, Walter Sickert and Osbert Sitwell were among its supporters. From Bow to Biennale: Artists of the East London Group is based on correspondence and interviews with the last, now-deceased Group members plus primary and secondary archival research over many years. Extensive artist biographies are included plus chapters covering members’ involvement in film, the stage and poster work; Cooper’s mosaic revival; and his wife Phyllis Bray’s huge murals for the New People’s Palace in Mile End Road. From Bow to Biennale is the first study of this important group of artists. Richly illustrated, the story of the East London Group is examined in detail, with biographies of the artists involved and a list of their paintings in public collections. This revised edition includes exciting new material that has emerged since the publication of the first edition, partly due to the East London Group website (www.eastlondongroup.co.uk) and personal contacts. Fascinating sidelights on the lives of the artists involved in the group, as well as twenty-six newly discovered paintings and photographs, are included in an Afterword. David Buckman has been a journalist and author for over 50 years, initially a staffer on several publications. While working in the London bureau of an American-owned energy magazine he travelled in Europe, North Africa, the Middle east and Southeast Asia. Going freelance in 1975, he wrote for numerous magazines and newspapers and made several hundred radio and television broadcasts. After the first edition of his dictionary Artists in Britain since 1945 appeared in 1998 (second, revised and expanded edition, 2006) he has concentrated on arts writing. He contributed to Macmillan’s Dictionary of Art and Brian McFarlane’s Encyclopedia of British Film. Monograph subjects include J B Mason, Leonid Pasternak, Martin Leman and Glyn Morgan; Mixed Palette, a study of Frank Ward and Kathleen Walne; Charles Debenham’s East Anglia; a biography of the sculptor A H Gerrard and more recently Lancelot Ribeiro – An artist in India and Europe. He has written many obituaries for the Independent, Guardian, Telegraph and elsewhere, is an advisor to the Public Catalogue Foundation and on the council of the Critics’ Circle. 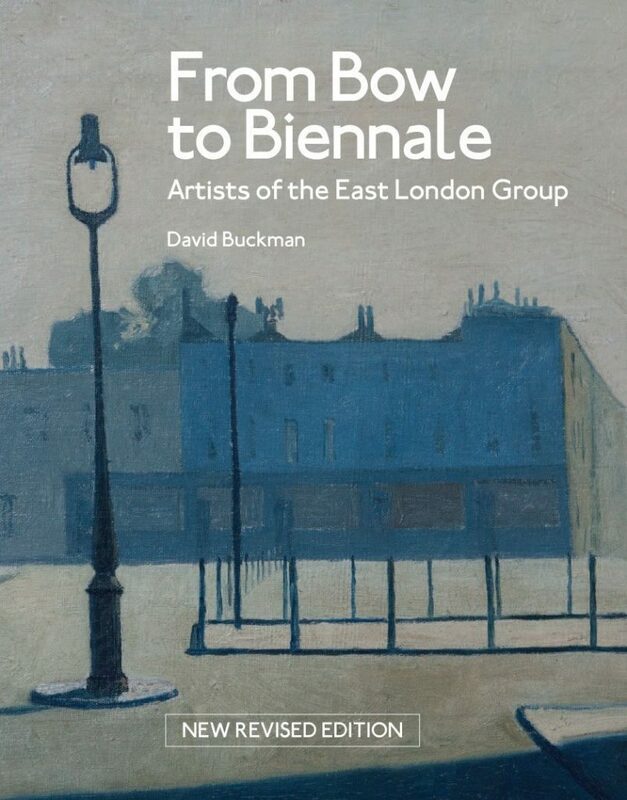 When David Buckman’s From Bow to Biennale, Artists of the East London Group was published in 2012 it was the result of nine years of research and shone a light on an unknown group of East End painters who briefly flourished for a decade across the twenties and thirties. They were amateurs, night school pupils of a messianic teacher called John Cooper. Their fame resounded briefly internationally, but then was forgotten. Buckman, a journalist by training and technique, ferreted out the story, curiously reminiscent of the Pitman Painters of Ashington that William Feaver wrote about in 2008 and which became a successful Lee Hall play. Buckman had unearthed a goldmine. If I tell my customers that Lady Cunard has bought one of my paintings, and that one had been over to Ohio for a permanent collection, and that I had been mentioned over the wireless as an artist – do you think they would believe me? They would think I was just spinning a yarn. When the East London Group had its first exhibition at the Whitechapel Art Gallery in December 1928 the influential magazine Studio described it as ‘little short of sensational’. The amateurs had become accomplished painters, among them the brothers Harold and Walter Steggles (respectively a solicitors’ clerk and a shipping clerk), Albert Turpin (window cleaner), Reginald Tomlinson (school inspector), Elwin Hawthorne (house decorator) and the navvy Hattemore; some even got advertising commissions. The group’s origins had been in the Bethnal Green Men’s Institute Art Club whose librarian, A.K. Sabin, pompously wrote that the club was ‘the first serious attempt to interest the worker of the district in the executive side of art’. The institute’s first annual exhibition was in 1924 at the Bethnal Green Museum, all the exhibitors being self-taught. ‘My Bethnal Green gang produced good and various paintings’ said their teacher, William Finch. But by 1927 they had switched allegiance to the Bow and Bromley Evening Institute and a recent Slade graduate teaching there, John Cooper, who saw enough potential in them to launch them onto the West End gallery circuit, making a deal with the Lefevre Gallery. ‘Life in those days could be very new and exciting,’ recalled one of the group, Cecil Osborne, ‘and all art very wonderful, opening new vistas to be explored’. Born in Yorkshire in 1894, Cooper had served in the Royal Flying Corps in the First World War and with his ex-serviceman’s grant went to the Slade where he was taught by Henry Tonks. Graduating in 1922 he underpinned his income as a painter by teaching evening classes. He created a network of powerful supporters among former fellow students, subjects and collectors, such as Henry Moore, J. B. Priestley, Thomas Beecham, Arnold Bennett, Aldous Huxley, Ramsay Macdonald and Osbert Sitwell. For that first exhibition in 1928 ‘about 30 members drawn from Hackney, Whitechapel, East Ham, Poplar, Mile End and so on’ showed, according to the Evening News. The groups had grown from nine to thirty-five, and many of them wanted to do no more than paint images for greetings cards. Cooper steered them into more challenging areas. ‘It was his inspiration to get the members to stop painting film stars and to paint what was all about them, say, a dingy bedroom, and look at it in a new way’, said Nancy Sharp, a Slade student recruited to help by Cooper along with her fellow student and future husband William Coldstream. As early as 1924, Cooper had been surprised by the painter-like qualities of some of the students. ‘They boldly tackled scenes from their everyday life, seeing beauty in most unlikely subjects and reproducing it with surprising success’, he told the Evening News. Teaching help came from his Slade friends, and Rodrigo Moynihan was another of his assistants; Sickert gave the group informal lectures, telling them that expensive excursions to find landscapes to paint were unnecessary. ‘There is no need to go to Bognor,’ he said. ‘You can go into the Tube’. The Tate responded to the 1928 Whitechapel show, buying two pictures from it and, in the following year, putting on its own exhibition of 24 pictures from the group, showing ‘what British artisans can do in their spare time’, as the gallery’s press release put it. And so the amateur East London Art Club metamorphosed into a professionally recognised East London Group with Mayfair art dealers taking an active interest. In 1935 there was a touring exhibition of Canada and the USA, organised through the Courtauld Institute and augmented by contributions of professional London Group artists such as Paul and John Nash, Charles Ginner and C.R.W. Nevinson. The high point, though, was the inclusion of paintings by the East London Group’s Elwin Hawthorn and Walter Steggles in the 1936 Venice Biennale. The end of the group began when a five-year Lefevre contract ended in 1937, followed by the decision of the Bromley & Bow Institute to expel the group – because other students thought it unfair that they were allowed to use the institute’s facilities to exhibit and sell their work – and Cooper 42 left too. After some war work as an Air Ministry draughtsman, Cooper died of sclerosis of the spine in 1943, aged 48. The East London Group never exhibited together again, until the ten-week 2014 exhibition at The Nunnery, Bow (and more exhibitions are scheduled for the Nunnery and Southampton City Art Gallery in 2017). Although several of the artists continued to work and show, as well as pursuing their day jobs, they never exhibited as the East London Group again. ‘My efforts have been directed to stimulating the students to express something which they feel about life’, Cooper had told The Millgate magazine, ‘this was some of the reason for Rembrandt’s greatness’. David Buckman has a great story to tell and despite his fastidiousness in making sure every single fact is not missed, much like his meticulous researching, the book is an easy read, written by a reporter who has fallen for his subject. How is it that one of the most innovative, commercially successful, and – in its time – hugely publicized British art groups of the twentieth century became neglected? That was the case until my book From Bow to Biennale: Artists of the East London Group was published last month. During the writing of it, whenever I mentioned the Group to experts in this period, the response was usually – East London Group, just a name. My curiosity about the East London Group was aroused many years ago when I read an illustrated feature about it in the April 1931 issue of “Studio” magazine. As a private interest in early twentieth-century art developed over time and as I earned a living as a freelance journalist in a largely unrelated field, I would occasionally return to a photocopy of that article, which acted like a maggot in my mind. At the end of the eighties, when I was researching my dictionary “Artists in Britain since 1945” in my spare time, I decided to call at the last known address in Hampstead of the painter Phyllis Bray to check if she was still active. By then Phyllis was suffering from Parkinson’s Disease but, as we chatted, the East London Group was mentioned. She had been a member and, for several years, was married to its founder, John Cooper. She directed me to her daughter, Philippa, also an artist, who held the Red Book of press cuttings about the Group’s activities during the twenties and thirties. Thus began – when I could afford the time – the long, painstaking research to tell the Group’s story. As a start, the book of cuttings was photocopied to ensure a second copy existed and it became a collection that expanded as more cuttings were found. One of the problems for a researcher is that people who save cuttings sometimes do not date or source them or, if they do, someone else decides to tidy them up years later by snipping off these essential details. The Red Book had been subject to this treatment at some stage and, consequently, many weeks were spent in correspondence with likely helpers and in microfilm booths at the newspaper library in Colindale, pursuing clues on the back of the cuttings or the choice of typeface employed. By then, John Cooper was middle-aged and had only a few years to live, dying in 1943. As a charismatic young painter from Yorkshire, he had inspired such raw material as errand boys, shopgirls, basket-makers and window cleaners to give up their precious spare time several days a week to attend his East End classes. After teaching in Bethnal Green, he moved to a school in Bow where he attracted several dozen students. Many of these painters, showing as the East London Art Club, had an exhibition at the Whitechapel Art Gallery in December 1928. This prompted Charles Aitken, its former director, then in charge of what is now Tate Britain, to display some of the pictures at the Millbank gallery early in 1929, and that show lead to the Lefevre Galleries series, provincial shows, participation in mixed exhibitions in Britain and abroad, plus solo shows for many of the members. Walter, like his brother Harold, was grateful for the variety of teaching provided at Bow. John Cooper had been at the Slade School of Fine Art just after World War I and decided that a number of ex-Slade friends could aid his work and a few would later exhibit with the Group too. Phyllis Bray was one, William Coldstream another, but his real coup was to get Walter Sickert to make the trip into this unfashionable part of London to impart unique and often eccentric wisdom. Here was artistic royalty, and Lilian Leahy, who eventually married Elwin Hawthorne, recalled to me how as Sickert sat expounding, dressed in plus-fours and diamond-patterned socks, shopgirls would giggle with their hands over their mouths. The East London Group website lists the thirty-five artists I claim as members. In addition to the history of the Group, the book contains biographical essays on more than twenty of these, including such colourful characters as Murroe FitzGerald, Irish Civil War death sentence escapee, eventually managing director in London of the Acme Flooring & Paving Co – and Albert Turpin, professional window cleaner, Anti-Fascist protestor and Labour mayor of Bethnal Green, whose passion was to record the disappearing End End that he grew up in. Yet many of the other members remain ghostly figures, despite my research into their personal histories. As well as attracting Walter Sickert, John Cooper involve dozens of celebrities in his project. Charles Aitken encouraged the influential art dealer Joseph Duveen to buy paintings. Samuel Courtauld, Lord Melchett, Lord Burnham and the writer Arnold Bennett gave early financial help. Lady Cynthia Mosley and Osbert Sitwell opened exhibitions. The Prime Minister Ramsay MacDonald and Labour Party stalwart George Lansbury attended exhibitions and gave moral support. As their reputation developed over the years, the Group sold to influential collectors with the Lefevre Galleries welcoming extra, non-catalogue pictures, as sales rose and, on occasion, an exhibition’s term was extended. As I investigated, I found that John Cooper and his Group became involved in more than exhibitions of paintings. It was these multifarious non-gallery activities that consumed my time, calling for detective work. It emerged that the Group was involved in making a documentary film about their activities. Also, members also painted pictures for stage plays and contributed to Shell’s popular range of posters. Phyllis Bray created three huge murals for the New People’s Palace in Mile End Rd and John Cooper revived mosaic teaching at the Central School of Art, becoming director of Courtauld-Cooper Studios and producing exciting Modernist work. With such a large body of diverse work to its credit and dozens of works in public collections, the Group must take its place in any history of British Art in the first half of the century. Its omission would be scholarly negligence. And the story did not end with World War II as – thanks to the enduring inspiration of John Cooper – many members continued painting, long after the East London Group expired.